If you’d like to find out more about Ring Guard Ringworm Cream, then you’re reading the right review. Ring Guard Ringworm Cream is an anti-fungal product which claims to be capable of curing all sorts of infections on the feet caused by fungus, such as the most common athlete’s foot (tinea pedis), jock itch (tinea cruris) and ringworm (tinea corporis). This cream effectively suppresses and eliminates the symptoms which come with these uncomfortable infections, such as the blistering, cracking or scaling of the skin, an itching or burning sensation, or general irritation and discomfort. If you are interested in learning about the ingredients, the pricing and the guarantee policy of Ring Guard Ringworm Cream, then continue reading our review. The main active ingredient found in Ring Guard Ringworm Cream is Miconazole Nitrate, which is one of the quintessential substances in the field of fungal infections. It is on the World Health Organisation’s list of essential components, and with good reason. Like any other anti-fungal substance, this compound inhibits the production of fungal cell membranes. The dosage instructions for Ring Guard Ringworm Cream read the same as any other anti-fungal creams. Before you apply the cream, make sure you thoroughly washed and dried the target area. First apply a thin layer of Ring Guard Ringworm Cream, then massage it into the skin for its full effect. If you wish to eliminate an already present infection using this product, you should pay attention to the area between your toes, and apply the cream at least twice daily for a period of four weeks, but no longer than that. In the case of any irritation, you should seek medical attention. Strangely enough, some of the side effects of Ring Guard Ringworm Cream are identical to the symptoms it claims to cure. If you happen to be allergic to any of the ingredients, then you will experience skin irritation, burning, and discomfort when using this product. The cream should not come into contact with the eyes or face, and small children should not be treated unless you have been directed to do so by your physician. One 20 gram tube of Ring Guard Ringworm Cream costs $5.89 and $4.49 for shipping if purchased through Amazon. This price is quite high when compared to its competitors. Since this product is available from other sellers, so you might be able to find a better deal if you are lucky. Unfortunately, there is no universal guarantee for Ring Guard Ringworm Cream, since the manufacturer is not in charge of distribution. Each re-seller regulates their own refund policies. It is worrying, however, that there are no customer reviews to be found. 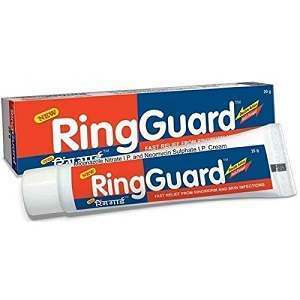 Ring Guard Ringworm Cream is a product with an effective formula and clearly stated easy-to-follow instructions. However, the price of this product is very high, and there is no guarantee policy or any customer reviews, which is concerning. Jimmy Rodriguez	reviewed Ring Guard	on June 10th	 and gave it a rating of 2.5.